So, here is my stitching progress over the last week. Monday I worked on the hair and wing of Woodland Fairy. I really love this one:) I really can’t wait to finish her, but I have mixed feelings about all the twigs and leaves. I didn’t really enjoy stitching the ones on the bottom and there are tons more in the top half of the piece. Well, I have already started with them…so I press onward. This weekend, I put my nose to the grindstone on M9. I am SOOOO far behind on this one. I haven’t officially finished part 8, yet part 11 comes out on Wednesday. Oh well!! All I have left on part 8 is the satin stich leaves on two of the artichokes. I think I am going to do the beading as I go. I have one and a half swirls beaded so far. After I finish part 9, I will need to pull out the q snap extension. It is getting really big:) I like what I have seen of part 10, but it is just so huge. I like the colors in it a lot better than all that yellow in the little triangles. It reminds me of splattered omlettes. 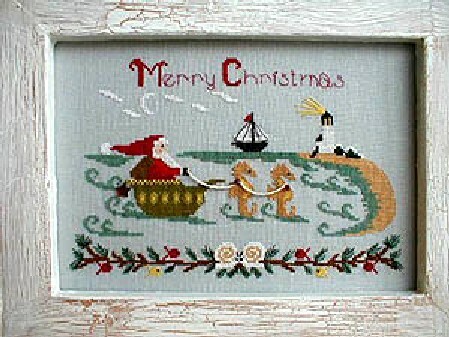 On and off throughout the week, I have been working on Santa by the Seashore by By the Bay. It is such a cute piece and a fairly quick stitch. I am a bit confused by it though. I was reading the stitching instructions and there were backstitch instructions for the eyes and tail of the sheep. I am not quite sure where the sheep is…do you? After Thanksgiving, my parenting class will be over and I will add Wednesday as a Small piece night. After I finish Woodland Fairy, I will put Butterfly Rest in its place. I have Butterfly Day hanging in our upstairs hallway and Allen keeps asking me when I will have its companion to put up. Off to do a little bit of Santa stitching before bed.